OK, it did not. But Moschino issued a collection inspired by the fast food giant. Vetements has collaborated with Champion, Reebok, Juicy Couture, Manolo Blahnik, Levi's, Dr Marten's, Eastpak, Schott, Lucchese, Mackintosh, Hanes, Brioni, Church's, Kawasaki, Comme des Garcons shirt, Alpha industires, Carhartt and Canada Goose. All of them in the same show. Need I say anything about H&M collaborations? Usually wildly successful (if I discount the Margiela one sadly!) and they revived the Versace brand when Donatella did the smart move and went to the archives and reissued prints from the Gianni days. Target has done the runaway success with - among others - Missoni and Finnish uber cool Marimmeko. 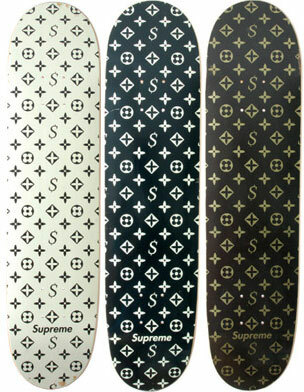 And now - in a case that can be dubbed "reverse snobism" - Louis Vuitton collaborated with skater brand Supreme. A friend went as far as to say he won't even wear the collab if it was given to him for free. I would though, because considering the Louis Vuitton price points, this collaboration between the two brands (remembering that Louis Vuitton filed a cease and desist against Supreme in 2000 following the later's issuing of t-shirts, beanies, and skateboards mimicking the French powerhouse logo) is not going to be cheap. New York Times critic Guy Trebay called it "the fashion version of a murder suicide". Kim Jones, mensewear head of design at Louis Vuitton however implied that he was just back from China and that the Vuitton consumer is now in his twenties and needed to be motivated and inspired, and how best to do that if not to team up with the holy grail of the skating world - namely supreme. Even Hermes, the venerable name known for its silk squares, did a graffiti collection with famed graff artist Kongo to lure a younger generation into its products. It all started with capsule collections, whereby high end brands would do specific small scale collections where the quality of the craftsmanship has not been compromised. But haute couture houses also did that via diffusion lines: Yves Saint Laurent created "Rive Gauche" his more sensibly priced collection, and the list continues with names such as Marc by Marc Jacobs or Miu Miu the kid sister of Prada. But naturally, when one moves to the website-crashing endeavors of H&M it is a totally different scale altogether - rumors swirled that Versace preferred to invest the budget in the marketing rather than the quality of the items for instance. And whereas the collaboration was indeed a roaring success, the products were certainly not to mainline Versace standards. One of the main driving factors of investing in high end brands, is the exclusivity factor. Seeing piles upon piles of Kenzo merchandise leftover from the original launch at H&M might not signal that quality. Indeed, when working on the Lexus account in Saudi Arabia in the early 2000s, and when we introduced a payment by installment system of buying, some Lexus owners were so livid they returned the cars they already owned as Lexus was seen as the most upscale prestige signal. For buyers who paid for the car upfront to share it with people who might have installment plans took away that sense of exclusivity which comes with the investment they did; in their own image and in the brand's image. What is interesting about such collaborations is that they end up being resoled at much higher margins, even much higher than original mainline items from the brand in question. The reasons are indeed perplexing, because why bother a "luxury brand x high street" at an exorbitant price, when one can walk into the "luxury brand" boutique and get it - sometimes during sales - at a very reasonable price tag. Could it be that collaborations mark a certain time and place? Margiela x H&M was a reissue of archival designs for example, designs which can never be found in the mainline stores anymore. This is a fact which makes me regret how little I invested in the deeply discounted items which remained from the collection. Whatever the reason, collaborations seem to be going further and further into the edge of the game to happen - literally, the pilots of the first Virgin Galactic trip were dressed from head to toe in Y-3 (the Yamamoto/Adidas brainchild brand) - and, the world appeared to be suffering from what appeared to be "collaboration fatigue": in 2012 the Narciso Rodriguez collection for Kohl's was already on the 50% off racks on the launching day. However, at some point, collaborations might be a new way for brands to diversify their market, reach cross-over customers even if it means for certain upscale brands to twist their standards or heritage: Margiela x Converse inspired a multitude of DIY projects as a testimonny of high brow-low brow genius of brand teaming up. Adidas is going full-fledged with this, with now its Stella McCartney and Raf Simons - with each targeting a different audience - full staples of its yearly offerings, and its ongoing collaborations with Japanese brands White Mountaineering or Kolor also making raves among those in the know. Even celebrities - who are brands in their own right - are giving it a go. Adidas Yeezy or Fenty x Puma by Rihanna anyone? (cue mass hysteria). In addition Adidas has just kicked off its "sneaker exchange" program - where brands and stores which were collaborating with Adidas one-on-one got to work together co-designing limited edition sneakers. When Balmain collaborated with H&M they issued a tshirt on which Balmain France was printed, which was totally identical in shape and typography to the Balmain Paris they sell on their usual line, but when one reads France rather than Paris one understands that the tshirt in question is the collaborative version rather than the "original". This is the same approach singer MIA adopted when she collaborated with Versace as she based her collection on the brand's bootlegs which were popular as she was growing up. Funnily, Alessandro Michele, the bad boy who single-handedly revamped Gucci just issued a tshirt based on counterfeit merchandise from the 80s which used to copycat the luxury brands. Except that Michele (in an act of subversion) actually appropriated the copy. There are however, those entrenched in the other camp such as the famous op-ed by Imran Amed, the founder of Business Of Fashion website against such collaborations, which basically argues that consumers who buy into them are not really taking a part of the original luxury brand. Many brands understand that, and the way they let the average consumer to their exclusive environment would be through the back door: Cosmetics and perfumes also serve the same purpose, after all, many women can afford to buy a Chanel (a brand who is famously never on sale) versus those who can get a No5 perfume or a lipstick from the Parisian interlocking-C brand. No matter, recently I was wearing my obscenely expensive Lanvin kicks and a Versace x H&M scarf and I got complimented on both (though not at the same time). In Woody Harrelson debut directing movie "Lost in London" (which was shot and broadcasted live in 500 cinemas - blurring the line between theater, live performance and cinema) Owen Wilson asks Harrelson: "Can a police car pull over another police car?" - with the way brands are collaborating these days, it seems a police car can. 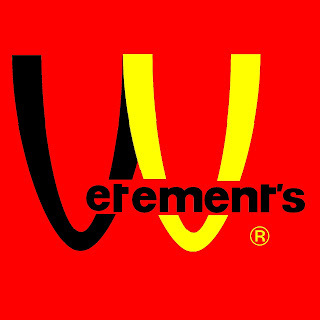 So perhaps, Vetements did collaborate with McDonald's after all.